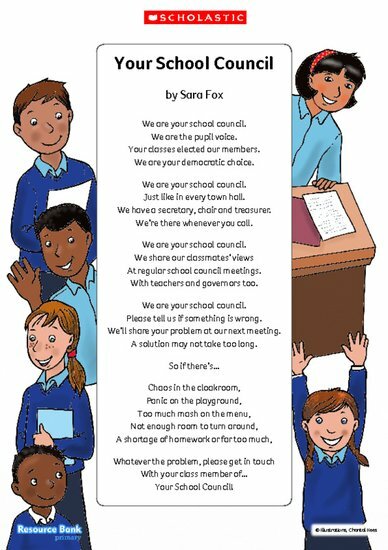 ‘Your School Council’ is a poem written from a School Council’s point of view. It is reminding pupils, that the school council is there to address their needs and share their views with teachers and governors. The poem emphasises that a school council is elected in a democratic way and is there to help to take school improvement projects forward. Many schools have a school council, just like a town council, that it is there to represent the views of the people who elected it (i.e. every class). The school council may be many children’s first taste of democracy and it is important that a fair and unbiased method is used to elect its members.